Chechnya Wedding Proposal: You WILL marry me! Articles Articles Index Chechnya Wedding Proposal: You WILL marry me! Chechen president Ramzan Kadyrov promised to “root out once and for all” the practice of bride kidnapping. The MSM and even women’s rights organizations ignore this abuse. Bride abductions are an endemic phenomenon in the Caucasus and Central Asia. In Chechnya alone, rights activists say as many as one in four marriages begin with the woman being kidnapped and forced to wed against her will. This practice is also found in Egypt, Kyrgyzstan, Pakistan, Kazakhstan, Uzbekistan, Georgia, Azerbaijan, Dagestan, Ingushetia, Rwanda, Ethiopia, Kenya as well as other areas in Central Asia, the Caucasus region, Southeast Asia, and the Romani in Europe. Chechnya, as noted by Radio Free Europe is probably the worst, but now the head of Russia's Muslim Chechnya region, Ramzan Kadyrov has publicly come out against the practice. Or has he? According to Russian state-run news web site Vesti.ru. The head of Russia's Muslim Chechnya region Monday urged followers to "eradicate" the age-old practice of bride kidnapping, a tradition outlawed by Russian law, but still practiced in the region. Analysts say the region's powerful leader Ramzan Kadyrov is facing increased pressure from his backers in the Kremlin to curb local traditions that violate federal laws, including what critics say are moves to introduce religious-based rules. Well, this sounds all well and good, but this is the same man who promotes attacks on women for being dressed to immodestly and has named members of the Human Rights Center “Memorial” the enemies of the people, enemies of the law and of the state as recently as July 3, 2010. On July 3, 2010 in an interview with TV channel “Grozny”, Ramzan Kadyrov named members of Human Rights Center “Memorial” the enemies of the people, enemies of the law and of the state. In today’s Chechnya this public statement of the President of the Chechen Republic sounds as a direct and clear threat. Republican officials and personnel of security services will take these words of Ramzan Kadyrov as an instruction to act against Memorial and its representatives. Some of them can take these words of their leader as an announcement that Memorial members are outlaw, with all the ensuing consequences. In the first half of 2009 the authorities of the Chechen Republic gradually intensified their public attacks on human rights defenders, including Memorial members. On July 15, 2009 Natasha Estemirova was killed. A year has passed. We observe similar tendencies. Public statements announcing human rights defenders “the enemies of the people, enemies of the law, enemies of the state” can have new tragic consequences. We would also like to note that in this interview Ramzan Kadyrov vividly demonstrates the discrimination of women in Chechnya. The President of the Chechen Republic openly approves illegal actions-shooting with paintballs at women whose look does not satisfy his criteria of modesty. This statement of Kadyrov, as well as his words about Memorial and human rights defenders are conducive to inciting hatred and the practice of illegal violence in Chechnya. The shooting of women with paintballs as mentioned above is from the same interview on “GROZNY” TV channel, with the President on July 3, 2010. Correspondent: In the city there were incidents when girls without headscarves were shot at with paintballs it was said that this was done with your consent. R. Kadyrov: Even if it were done with my consent, I would not be ashamed. I looked into this issue. Who was shot at? Naked women, who swallowed some kind of medicine? In fact, it turned out that these women had been warned several times. After such an incident, she should have disappeared from Earth, closed herself in her house and never come out, because she had behaved in such an inappropriate way that that such thing happened to her. She should have been ashamed to speak about it at home. How would she look in the face of her brother? “I was half naked, my belly was open, a skirt two fingers long, a transparent T-shirt…” But I haven’t seen those who were shot at. People talk about it. 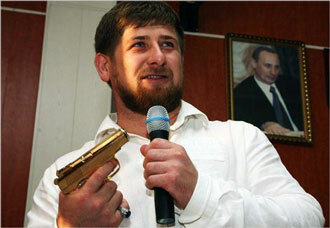 R. Kadyrov: How can I allow shooting at people with paint? Correspondent: And you do not know who is doing it? R. Kadyrov: I don’t know, but when I find them- I will express my appreciation! By some accounts Kadyrov was behind the July 15, 2009 murder of Natasha Estemirova, the Human Rights Activist mentioned above. Estemirova received threats from senior aides of Kadyrov. In March 2008 Kadyrov summoned her to a meeting at which he expressed extreme dissatisfaction with her work and her opposition to his new edict forcing women to wear headscarves. According to Orlov, head of Memorial, Kadyrov told her: "Yes, my hands are up to the elbows in blood. And I am not ashamed of that. I will kill and kill bad people." Estemirova was unimpressed and she ticked him off. So, how are we to believe that Kadyrov is sincere when he declares that he will root out once and for all from society the kidnapping of young women? GROZNY — The bull-necked president of Chechnya emerged from afternoon prayers at the mosque and with chilling composure explained why seven young women who had been shot in the head deserved to die. The 32-year-old former militia leader is carrying out a campaign to impose Islamic values and strengthen the traditional customs of predominantly Muslim Chechnya in an effort to blunt the appeal of hardline Islamic separatists and shore up his power. Initially after reading reports on ‘bride kidnapping’ I was going to write on yet another women’s rights issue with Islam at the core, but now I have to wonder why Kadyrov would have even mentioned the situation at all. Could it be just to keep Moscow and specifically Putin happy? This so called leader, Kadyrov is the largest hypocrite I have researched in a long-long time. I would bet my burka that he has no intentions whatsoever of trying to put a stop anything in Chechnya when it comes to women’s rights. Just when you think you've heard it all...thanks, Gadi, for educating us on this issue. I've known there were islamic type issues there in Russia, but I guess I didn't know the extent. I'll help spread the word...and remind others...just because you don't think it's happening in America...doesn't mean it's not...or won't.